The Bastion Patsas was launched at the defence exhibition DSEI 2010. The Bastion Patsas is a light wheeled armoured vehicle. The Bastion Patsas offers Level 2, NATO STANAG 4569 mine protection. Bastion Patsas is a light wheeled armoured vehicle developed by the French defence vehicle manufacturer ACMAT. The Bastion Patsas was launched during the DSEI 2010 defence exhibition held in the United Kingdom. The vehicle was primarily developed for French special forces. The Bastion is intended to meet the requirements of armed forces in Europe, Africa and the Middle East. It is equipped to withstand extreme weather conditions in the Middle East and Africa and deliver high performance during day/night operations. The Republic of Chad purchased 22 Bastion PATSAS vehicles in October 2012. Chad took delivery of the first 11 trucks in February 2013, while the remaining vehicles are scheduled to be delivered by the end of 2013. The Bastion Patsas incorporates a high-hardness armoured monocoque shell. The body is made of a rigid mechanical-welded frame and cold stamped HEL steel sheet. The frame of the vehicle includes U-shaped 210mm x 90mm x 8mm side members. The conventional vehicle layout of the Bastion Patsas includes an engine in the front, crew cab in the centre and troop compartment at the rear. "The open top design of the vehicle allows flexibility in installing several types of equipments such as machine guns, missile systems, surveillance, and reconnaissance and goal acquisition systems on it." 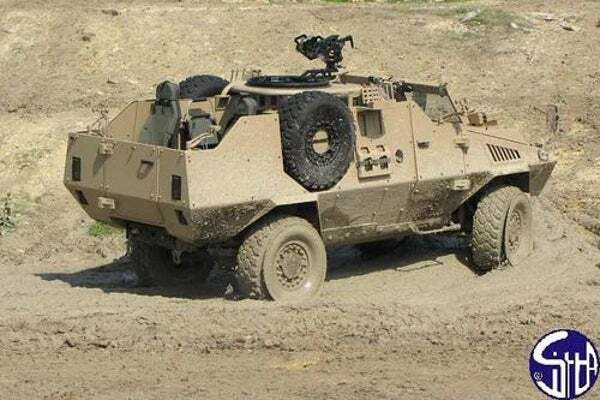 The open top design of the vehicle allows flexibility in installing several types of equipments such as machine guns, missile systems, surveillance, and reconnaissance and goal acquisition systems on it. The vehicle has an overall length of 6m and width of 2.2m. The cabin is designed with a height of 2.4m. It has a wheel track of 1.83m, wheel base of 3.6m and a ground clearance of 0.6m. The Bastion Patsas can accommodate a total of five crew members, including two in the front and three in the rear. The vehicle comes with an air-conditioned cabin with a windshield defrosting feature. The front and rear lights of the vehicle have a black out function and include grids for protection. The vehicle is installed with a rear hook featuring a brake shovel system for towing and a pioneer tool kit (Shovel, axe and pickaxe). The vehicle can be installed with several optional equipments such as the 24V pre-equipment kit radios communication systems and 6.8t pulling force front electric winch. The vehicle can also be optionally installed with an automatic central tyre inflation system (CTIS), additional spare wheel and large capacity (400l) fuel tank. The Bastion is offered in two variants namely, Bastion Patsas and Bastion APC. The Bastion APC is configured for troop transport, while the Bastion Patsas is a semi-open-top design developed in association with the French special forces for reconnaissance and assault. The hull of the Bastion Patsas is constructed of high-hardness armoured steel. The armour of the vehicle offers Level one to Level three NATO STANAG 4569 ballistic protection. The glass of the vehicle provides Level one to Level three NATO STANAG 4569 ballistic protection for its crew. "The Bastion APC is configured for troop transport, while the Bastion Patsas is a semi-open-top design developed in association with the French special forces for reconnaissance and assault." The armoured vehicle is also designed to provide Level two, NATO STANAG 4569 mine protection. It is installed with smoke grenade launchers and offers ten storage spaces for assault rifles. The power plant of the Bastion Patsas includes a five-litre, four in-line cylinder, turbo diesel inter-cooler engine coupled with a manual seven-speed gear box (one reverse, six forward). The engine is offered in Euro 3 and Euro 2 standards. The Euro 3 engine can generate a maximum power of 215hp (158kw) at 2,300rpm. It can produce a maximum torque of 815Nm at 1,200rpm. The Euro 2 engine can generate a maximum power of 180hp (133kw) at 2,300rpm. It can produce a maximum torque of 700Nm at 1,400rpm. The Bastion Pasta can burn either diesel or jet fuel of f-63 grade. The fuel tank can carry a maximum of 300l (2X150l) of fuel. The Bastion Patsas is designed to perform several critical operations in different terrains. It has a maximum speed of 110km/h and can reach a distance of 1,000km without refuelling. The Bastion Patsas is fitted with a hydraulic power steering. The axle system of the vehicle includes rigid axles with hub gear and positive locking differential. The suspension system of the vehicle consists of parabolic multi-leaves spring Oleopneumatic shock absorbers. The braking system includes an Oleopneumatic system with air dryer. It includes front rear disc brakes and an optional anti braking system (ABS). The vehicle is fitted with four Michelin 365/80R 20 XZL tyres. It can ford to a water depth of 1m. It is air transportable by C130, C160, A400M, and CH47 military transport aircraft. ERC 90 (Engin de Reconnaissance à Canon de 90) is a family of 6×6 wheeled armoured vehicles which was developed by Panhard General Defence for the French Army, as well as export markets. Fennek 2 is a family of wheeled armoured vehicles being developed by Krauss-Maffei Wegmann (KMW), a company based in Germany.